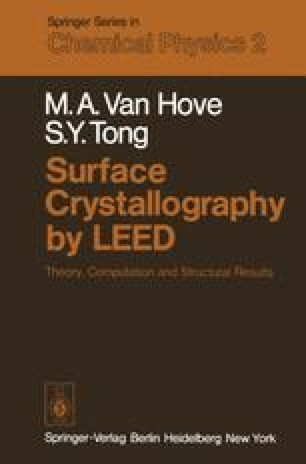 In this chapter, we summarize the surface structures obtained with LEED until early 1978. Further details may be found in the bibliography (Sect. 12.4), while a more systematic discussion is given elsewhere . We include results obtained by kinematic (KLEED), Constant-Momentum-Transfer-Averaging (CMTA) and Quasi-Dynamical  (QDLEED) LEED theories, and identify those as such.